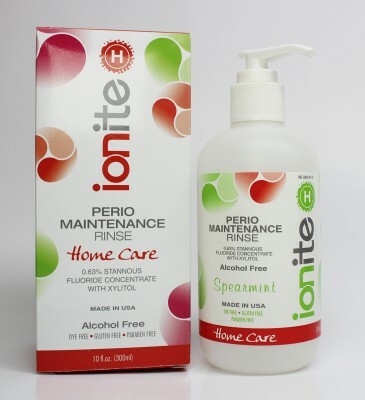 • Ionite-H Home Care Perio Rinse is a clear anti-cavity and anti-gingivitis rinse that contains 0.63% stannous fluoride. • It reduces sensitivity and plaque biofilm while inhibiting the cariogenic microbial process. It reduces gingival inflammation. Prevents demineralization and promotes re-mineralization. • Stannous fluoride is non-water soluble so there are no food or drink restrictions after application.